The Secret to a Successful Career in Massage - in just 30 Days! BlogHome » Integra Blog » The Secret to a Successful Career in Massage – in just 30 Days! The Secret to a Successful Career in Massage – in just 30 Days! Many people are drawn to a career in massage. It’s the kind of work that let’s you feel fully self-expressed and you have the satisfaction knowing you’re making a real difference in other people’s lives. There is a reliable career path and I’ll to show you the secret to how you can have a successful career in massage in just 30 days! You know who you are. You are someone who loves being with people. You love the feeling of personal connection and you have the natural gift of being able to intuitively know what people need – kind words, a warm hug, a patient ear. You need to share your gifts with the world. As technology advances and we’re able to do more – faster, instead of creating a world that is more connected, we are, ironically, becoming more isolated from each other. We are transfixed with our smartphones and we walk around in a daze with our ear buds, in our own worlds. People are feeling increasingly lonely and disconnected and they crave the comfort of meaningful connection. The world needs you to help people feel connected. Our population is aging. The Baby Boomers are moving into their retirement years and they will double the population of seniors in Canada over the next 20 years. Many of them will be on their own, isolated, without the support of family. The best gift we can give them is our conscious time and attention and help them feel connected with people around them and their communities. You can share your natural gifts in a way that creates meaningful connection and at the same time, create a fun, new wellness career for yourself – one where your natural gifts are well-rewarded. The “Only One Way to Do It” lie has kept many talented and compassionate people from pursuing their dreams. If you’ve looked into the RMT program, you were probably taken aback when you saw the tuition cost and time commitment (In B.C. it can be $20,000+ for tuition and 2 years in full time study). For many people, the thought of going into that much debt and being forced to commit to 2 years of full time study is completely unrealistic. On top of that, the demands of the program make it unlikely you’ll have the time or energy to make an income while you’re in school. Most people have family and personal commitments and while the idea of starting a new career in massage is very exciting, the only realistic way they could do it (without going into great debt) is to be able to continue to keep working and making an income. Many people have gotten to that place where they realize the RMT program is not going to work for them and because they’ve been told it’s the only option – they’ve give up on their dreams to have the career in massage they really want. You don’t have to give up your dream. There is another career path you can follow to have a successful career in massage. It’s called the Toolbox Approach. It’s a simple approach and one that will help you make a career in massage a reality. The Toolbox Approach is based on starting with one, short duration “foundation” massage training program and then over time taking additional trainings to build-up your skills “toolbox”. For this approach to be effective, you must start by making your first “foundation” training program a massage technique that will help you build your community presence in the fastest way possible. The more visible you are, the easier it will be to attract the people you’re meant to serve. These clients will provide you with the income you need and you can set aside the surplus to pay for future short duration training programs. Over time, your skills toolbox will grow and you’ll do more business with your existing clients, plus attract new ones. Your clients will also nudge you in the direction of new training programs, based on the new services they would like to try. What’s the very best “foundation” massage technique to start with? Through our Quick Start Online Chair Massage Course, you can be trained and working on 30 days! The training process is very flexible. You progress through the online modules at your own pace and we give you guidance and feedback. 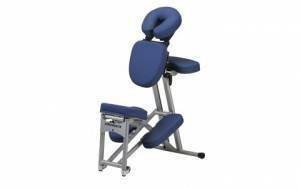 Chair massage is ideal for people who want to work 2 or 3 days a week, 4 to 5 hours a day. The chair is portable (weighs 20 pounds) and your clients remain fully-clothed. That means you get to offer your massage in some really interesting places: workplaces, retirement communities, music & craft festivals, trade shows & conferences, farmer’s markets, golf tournaments, airports and shopping centers and even on a beach in some far-off, exotic location! Once you have your chair massage sites established (you’ll learn how to build your business in the program), you can start to look at taking other short training programs. 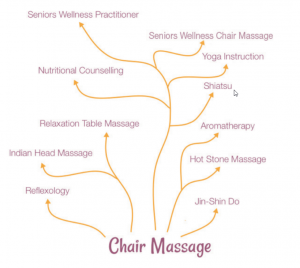 Techniques like reflexology, reiki, table relaxation massage and hot stone massage are just a few examples of skills that are natural offshoots of chair massage. Think of Chair Massage as the foundation massage technique that will help you get established in your new career and attract your base of loyal clients. As you get to know your clients, you can ask them what other services they might be interested in. The combination of their feedback and your personal interests will guide you as to what short training course you’ll take next. You’ll now have more services to offer, which means you can start to create unique service packages that combine services. That will lead to more income – plus you’ll strengthen your relationship with your existing clients, which will help you earn more referrals. And the process builds on itself. The demand for people with your natural gifts is huge and it’s going to get bigger over the coming years. If you’ve been looking for an opportunity to use your gifts more fully, becoming a Certified Chair Massage Provider could be right for you! Bob is the founder and president of Integra College, an online educational institution, dedicated to innovative, progressive, wellness-focused programs, that help people ignite their second careers. Integra College's Clever Companion program teaches healthcare and wellness providers, and other professionals interested in working with seniors, how to effectively interact with seniors to keep their minds active and engaged.